One giant way to reduce overwhelm in your service business is to keep track of new leads. As entrepreneurs, we put a LOT of effort into lead generation – marketing strategies, content creation, being visible, they all take a lot of mental and physical effort, and a huge amount of time. However, if you don’t have the stepping stones in place to manage all of those leads, the warm leads you have can quickly become cold, forgotten, or overwhelming! Two key problems that I see, and have experienced myself is that with so many social platforms, and multiple lead generation offerings out at any one time means that enquiries can come at you 24/7, and ALL OVER THE PLACE. No wonder it’s hard to keep track of them all! Even if you have some of these, it can still be time consuming to answer the questions, check if they’ve booked in, follow them up if they’ve forgotten to respond, or just see if they’re still interested. On top of tracking them all is actually finding the time to do this, so that it’s not piecemeal. I’ve learnt from experience that if I do it just by remembering, then it’s the thing I think about as I go to bed – instead of having a plan in place to manage it. You can do this in a spreadsheet or document table, or in Asana, where you can track them as new, followed up, and then converted into client. You do not need to be tech-savvy to do this. Keep track of leads by adding each new inquiry name and email, which service they are interested in and when you were last in contact with them. You’ll end up with a whole list in one place of everyone that is a warm lead. To reduce the time consuming back and forwards conversations, or even losing the email thread in your Inbox, set up email templates that answers the frequently asked questions and provide links for the next step a warm lead needs to take. This cuts out the questions and hand holding and reduces a lot of time for you – and provides great customer service in a professional way. Block out half an hour a week to keep track of your new leads in your list. One thing about new leads is that they are HOT! You don’t want to miss them, or leave money on the table. As well as receiving the leads and setting up email templates and a spreadsheet, you need to block out time to follow them up. Batching this is a really efficient and effective way of keeping track of your new leads, and boosting your conversion rates. Email or check in on each one – AND a bonus tip – use a template so you can copy and paste your follow up. This will help you improve your conversion, but also convert your leads quickly. Another bonus is that you will get more information and experience about the decisions your leads are making, and the questions they have – all good information to improve your sales process. Providing less choice for your leads can help to reduce confusion and the time taken to answer their questions. Keep the path is clear your customers and your admin – it will save you and your leads a lot of time. Set up a form for your leads to complete so that you have all the info you need to screen your leads. You can use a Google form, so that you can include the link with your email, again reducing that thread of conversation and streamlining the on boarding and conversion process. Use an online scheduler is set up so that your new leads can book a time with you, or even pay you and convert straight away. Gone are the days of the back and fro availability emails! There’s no need to do that anymore. There are loads of online schedulers around. I recommend Acuity or Calendly (and both have payment and form options). This tip is to help you realise that this is part of a bigger strategy that you will need to be really clear on to grow your business. Getting the moving parts set up, such as the online scheduler, forms, the emails, or having that automated so it’s not reliant on you checking your emails all the time, and receiving payment are the operational side of converting leads, but you can see that there’s also managing the leads. Set up the systems for the operations, but don’t forget that you also need systems and clarity on how you are going manage the leads, and how to keep track of new leads is just one small part of the bigger picture. 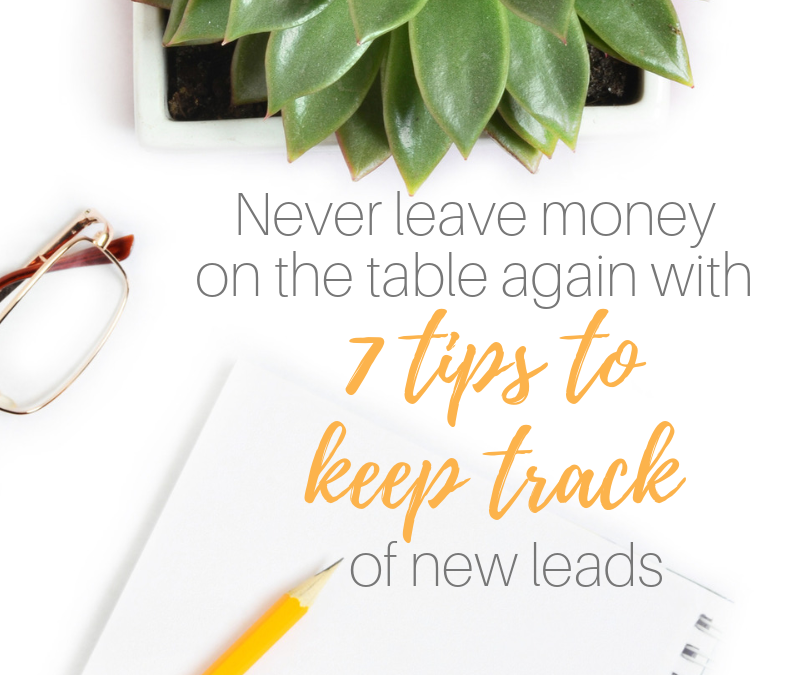 When you have clarity on that whole workflow, then keeping track of your leads can become effortless, some of it can be automated, but by getting this small part of it set up, you won’t be leaving money on the table again. Want to know more about how to manage your clients, and the systems side to converting them – without taking up even more time? I’m running a webinar on 28 Feb all about creating a clear workflow for clients from lead to conversion.